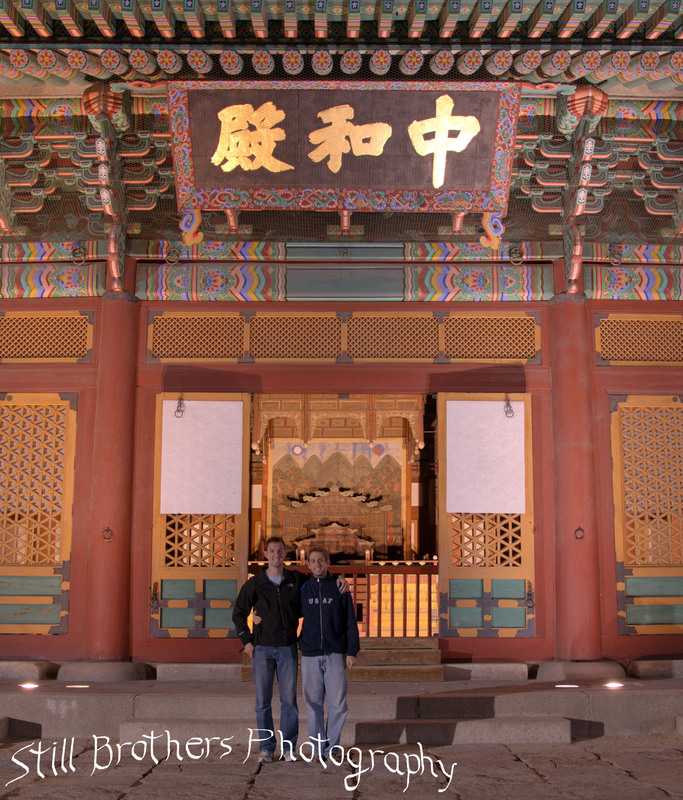 Ben and I decided to visit Doeksugung Palace after I got out of work one evening. 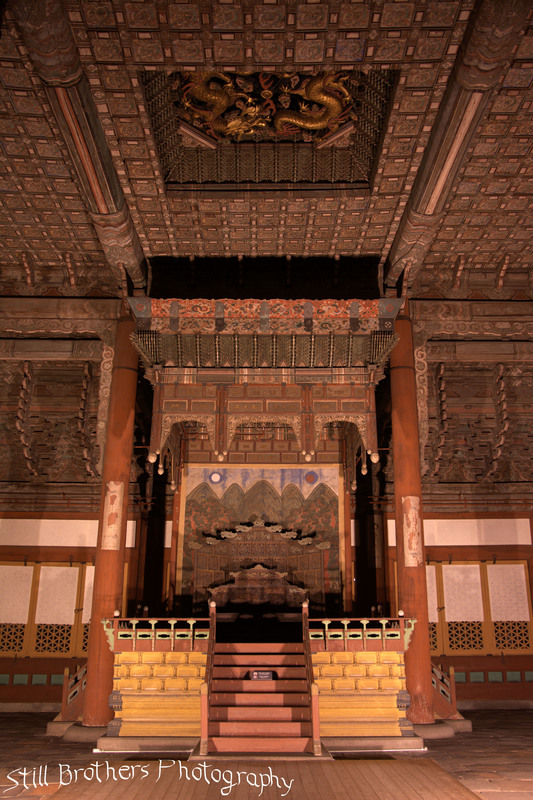 This would be our 3rd of the 5 Grand Palaces built by the Joseon Dynasty. The palace stays open until about 9pm so Ben met me at the subway near my school and we were off to the City Hall subway stop. 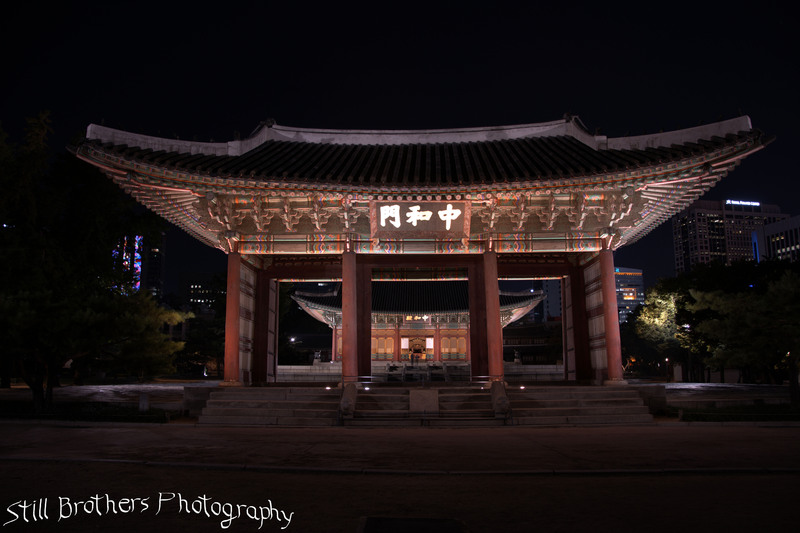 The palace is easy to find and has a nominal fee of ₩1000 to enter. The gates are an impressive set of 3 massive double doors; if you get there late enough you might be able to see them closed, although they are usually open to allow visitors in and out. 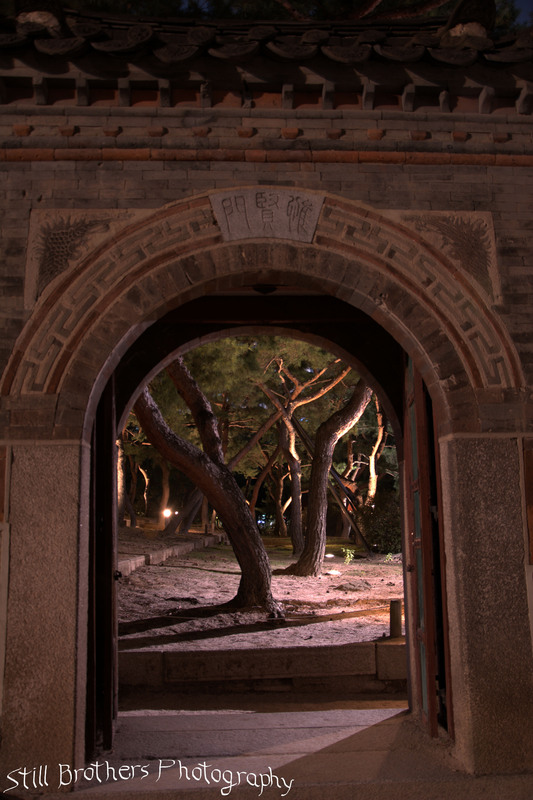 The path past the gates has tree cover and a peaceful aura about it while the brilliance of the city peers over the walls. There are a handful of signs describing the histories of the palace buildings being built as recently as the 1900’s before you quickly arrive at the pavilion in front of the throne room. Another massive gate stands guard over a concrete courtyard that leads up to an intricately designed throne room. 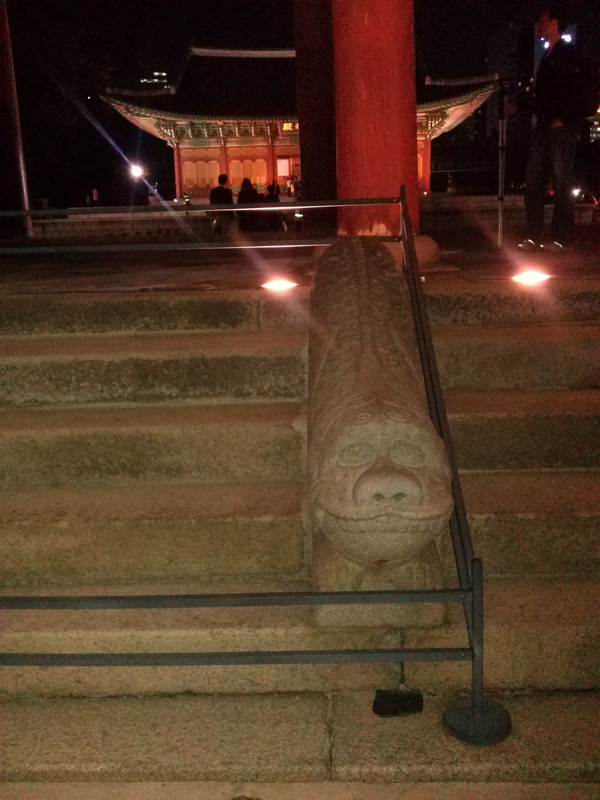 The decor of Doeksugung was very similar to what I found at Gyeongbukgung and Changdeokgung but with a night sky the experience feels entirely different. 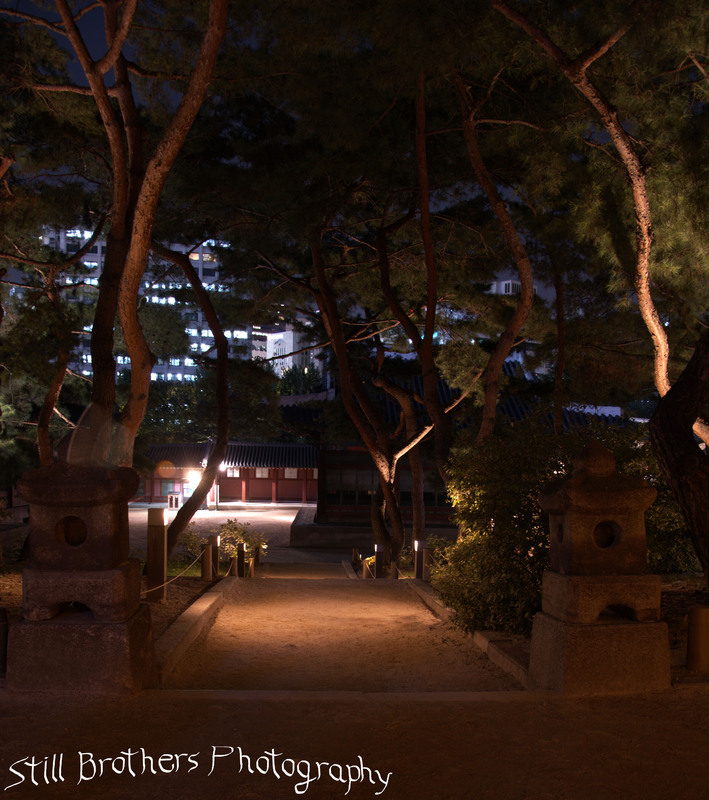 I imagined patrolling these grounds as a night watchmen listening as much as watching for creeping Japanese ninjas. We snapped a few pictures and played with the shadows before continuing to explore. 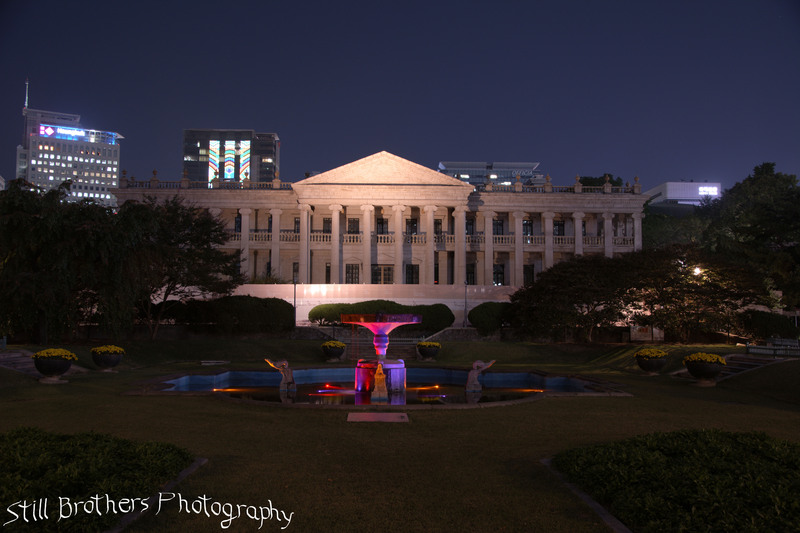 Most of the buildings here are designed and decorated with traditional Korean decor but there are a few with a modern flair. 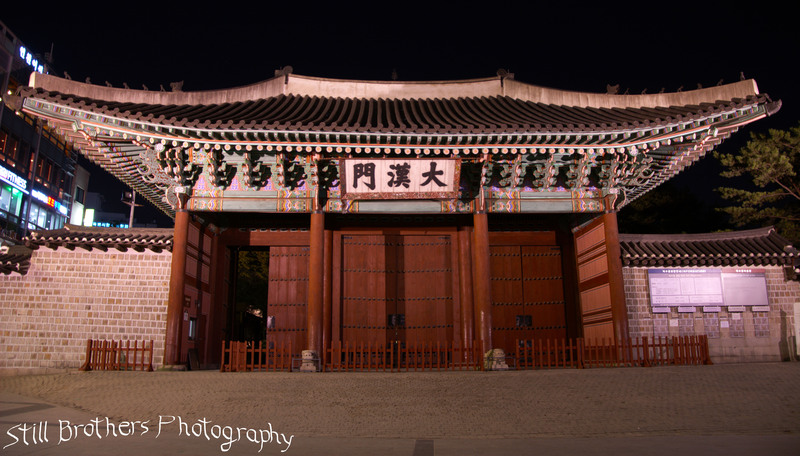 Seokjojeon is a Western style building used by King Gojong as a sleeping quarters and audience hall. It was added to the palace by British architect G.R. Harding in 1910 with 19th century neoclassical style and Corinthian columns. The colorful fountain out front provides a stark contrast to the glowing skyscrapers surrounding the area. 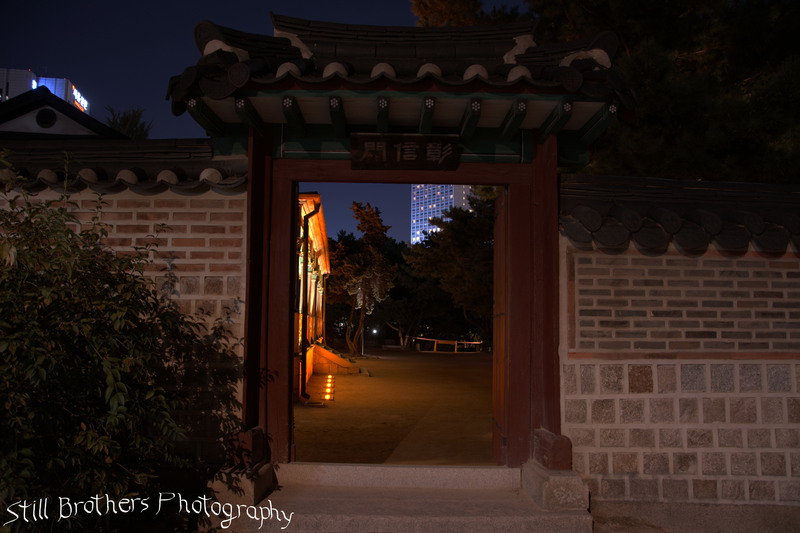 Continuing our tour of Doeksugung we encountered another elaborate bell and a small forested area winding through gates and smaller buildings. 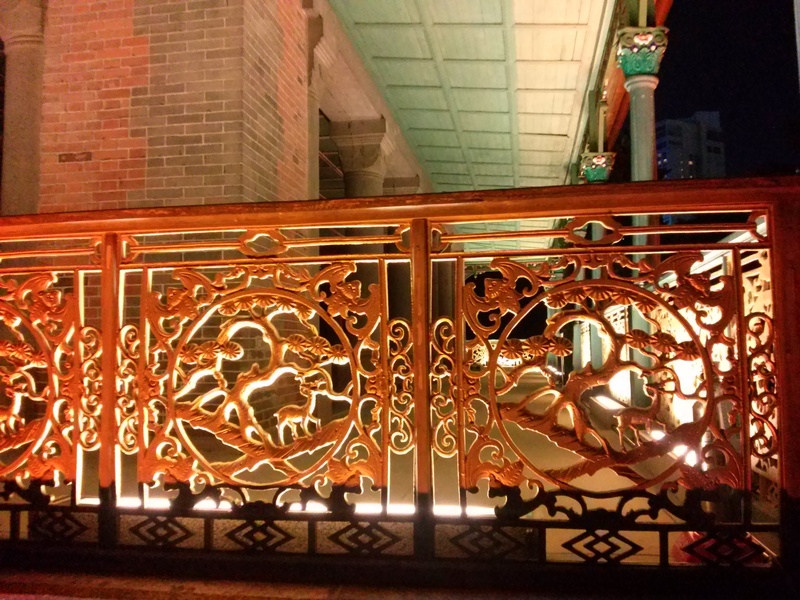 A secluded open air pavilion provided a golden glimmer to the pathway shining off its delicate displays carved into the outer colonnade. 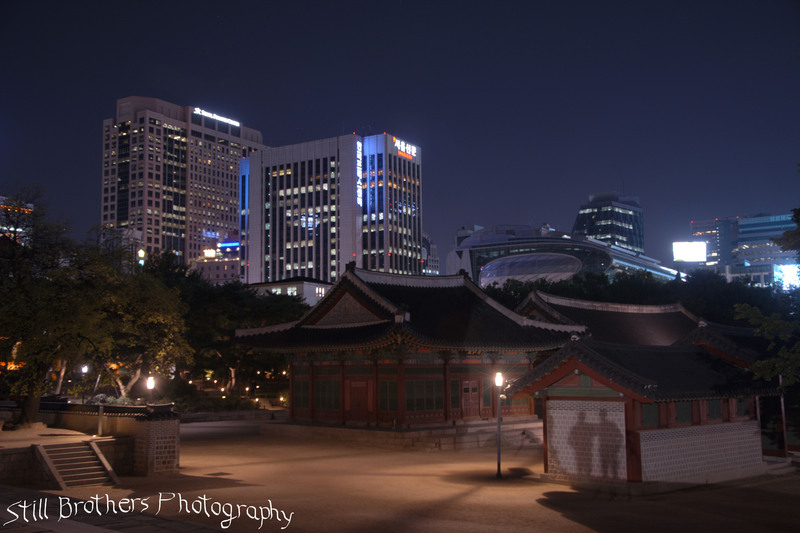 The glow of the city continued to astound us and provide a backdrop that teleported us through time. 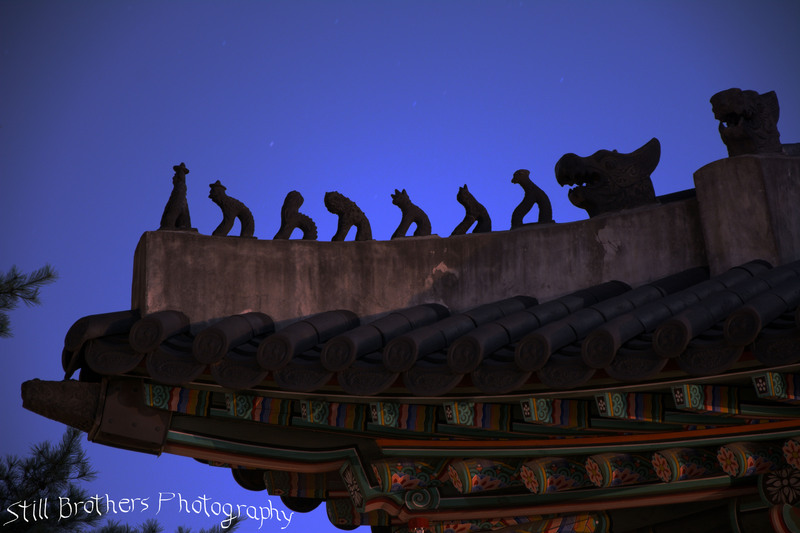 Ben stopped and set up his tripod for a long exposure of the gargoyles atop the nearest structure. The black night sky turned blue as he let more light in; capturing the splendid coloration that was all too common at these royal palaces. We made our way back out of the castle leaving just before 9. It only took about an hour and a half to tour the entire grounds which was a perfect excursion for a work night. Back on the street we noticed a police line, perhaps here to protect Doeksugung or the glamorous glass city hall situated behind the old stone center of town. 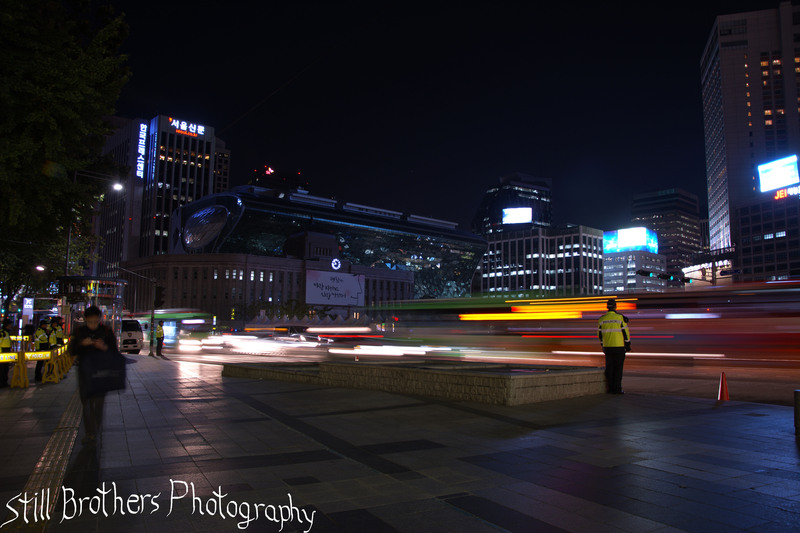 With one more long exposure he captured the buzz that surrounds Seoul in all hours of the night. I joined Twitter, forgive me!